CARLSBAD, Calif. -- A 12-year-old boy who was hit by a small plane Saturday that crash-landed on a crowded California beach was in the ICU late Sunday night. 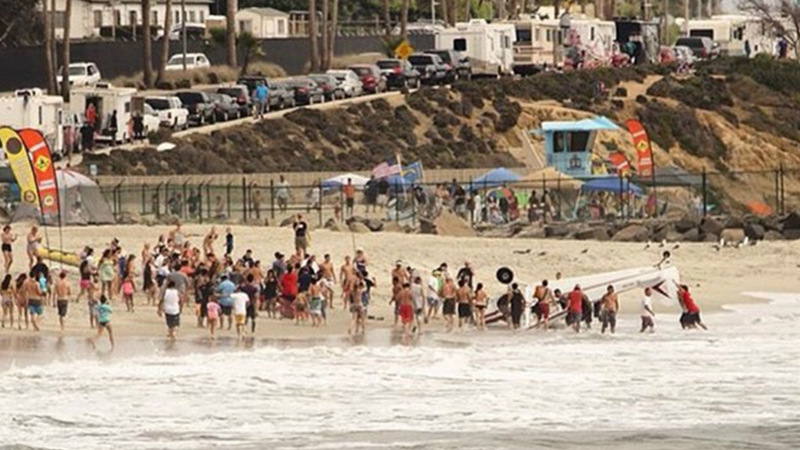 A small plane towing an advertising banner crashed onto a beach in San Diego County Saturday. The single-engine Piper PA18 lost engine power shortly after 3 p.m. and landed on Tamarack State Beach in the 4600 block of Carlsbad Boulevard in Carlsbad, Federal Aviation Administration officials said. Pictures showed a single-engine plane upside down on the beach. The pilot, 23, was not injured, FAA officials said. Police said the boy was hit by the plane and was taken to Rady Children's Hospital with a gash to his head.